Reveals North Carolina's Gold Region. A New Map of Nth. Carolina with its Canals, Roads & Distances from place to place along the stage & steam boat routes. 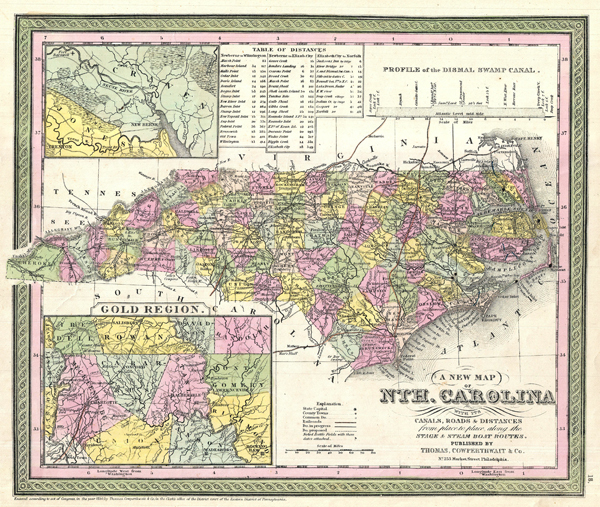 A fine example of Samuel Augustus Mitchell's important 1850 map of North Carolina. This map shows cities, topographical features, railways, ferries and roads with color coding at the county level. In addition to cartographic information this map is full of practical data for the armchair traveler including a profile of the Dismal Swamp Canal (an important trade artery in the region), a Table of Distances, insets of the vicinity of New Berne and the Carolina Gold Region. Rumsey 0537.019. Phillips (Atlases) 6103-18.